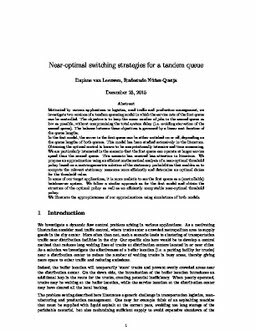 Motivated by various applications in logistics, road traffic and production management, we investigate two versions of a tandem queueing model in which the service rate of the first queue can be controlled. The objective is to keep the mean number of jobs in the second queue as low as possible, without compromising the total system delay (i.e. avoiding starvation of the second queue). The balance between these objectives is governed by a linear cost function of the queue lengths. In the first model, the server in the first queue can be either switched on or off, depending on the queue lengths of both queues. This model has been studied extensively in the literature. Obtaining the optimal control is known to be computationally intensive and time consuming.We are particularly interested in the scenario that the first queue can operate at larger service speed than the second queue. This scenario has received less attention in literature. We propose an approximation using an efficient mathematical analysis of a near-optimal threshold policy based on a matrix-geometric solution of the stationary probabilities that enables us to compute the relevant stationary measures more efficiently and determine an optimal choice for the threshold value. In some of our target applications, it is more realistic to see the first queue as a (controllable) batch-server system. We follow a similar approach as for the first model and obtain the structure of the optimal policy as well as an efficiently computable near-optimal threshold policy. We illustrate the appropriateness of our approximations using simulations of both models.